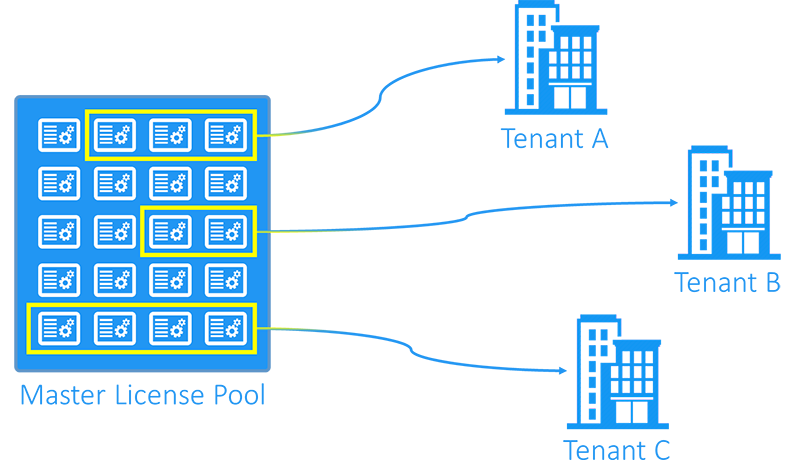 In the Multi-tenant mode, NAKIVO Backup & Replication enables creating multiple isolated tenants in the single copy of the product. The tenants can represent branch offices/departments in enterprise environments or clients in Cloud Provider environments. Since tenants are isolated and need to have a limit as to how many licenses each of them can use, NAKIVO Backup & Replication provides the License Delegation feature. In the Multi-tenant mode, Master Admin (tenant manager) can install one multi-socket license in the product and then assign (aka delegate) a specific number of licenses to each tenant. For example, Master Admin can install a 20-socket license in the Multi-tenant mode of NAKIVO Backup & Replication, and assign 3 licenses to Tenant A, 2 licenses to Tenant B, and 4 licenses to Tenant C, while 11 licenses will remain unused. At any moment, Master Admin can redistribute licenses: revoke any number of licenses from any tenant, which will return them to Master License Pool, and add licenses to another tenant. The License Delegation feature makes license management simple and manageable in large and distributed environments.